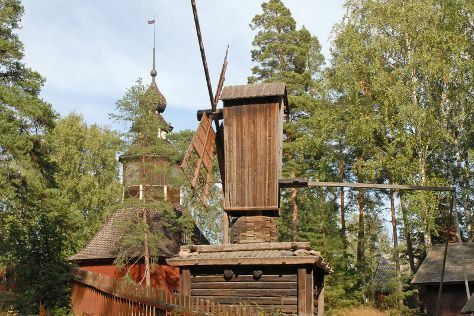 You'll explore the less-touristy side of things at Seurasaari Island and Open-Air Museum and Ullanlinna. Appreciate the collections at Sea Fortress Suomenlinna and Kansallisgalleria. When in Helsinki, make a side trip to see Nuuksio National Park in Espoo, approximately 46 minutes away. There's lots more to do: contemplate in the serene atmosphere at Rock Church, take a stroll through Katajanokka, appreciate the extensive heritage of The Esplanadi Park, and pause for some serene contemplation at Helsinki Cathedral. To find where to stay, ratings, maps, and other tourist information, go to the Helsinki planner . Brisbane, Australia to Helsinki is an approximately 24-hour flight. You can also do a combination of flight and train. You'll gain 8 hours traveling from Brisbane to Helsinki due to the time zone difference. In August, daytime highs in Helsinki are 24°C, while nighttime lows are 13°C. Cap off your sightseeing on the 11th (Sun) early enough to travel to Inari. On the 12th (Mon), see the interesting displays at Siida, relax in the rural setting at Inari Reindeerfarm, and then get a tailor-made plan with Reindeer Farm Petri Mattus. On the next day, gain interesting insight with Lemmenjoki National Park. For where to stay, reviews, traveler tips, and more tourist information, read our Inari trip itinerary planner. Traveling by combination of flight and shuttle from Helsinki to Inari takes 4 hours. Alternatively, you can drive; or do a combination of train and bus. Traveling from Helsinki in August, expect Inari to be a bit cooler, temps between 19°C and 9°C. Wrap up your sightseeing on the 13th (Tue) to allow time to travel to Pyhatunturi. On the 14th (Wed), explore the wealth of natural beauty at Pyha-Luosto National Park. On the 15th (Thu), you'll have a packed day of sightseeing: explore and take pictures at Amethyst Mine Lapland, then look for all kinds of wild species at Kopara Reindeer Park, and then identify plant and animal life at Wildlife Areas. To see ratings, reviews, more things to do, and tourist information, read Pyhatunturi day trip planning app . Traveling by car from Inari to Pyhatunturi takes 3.5 hours. In August, plan for daily highs up to 20°C, and evening lows to 9°C. Finish up your sightseeing early on the 15th (Thu) so you can travel to Salla. Salla is a municipality of Finland, located in Lapland. 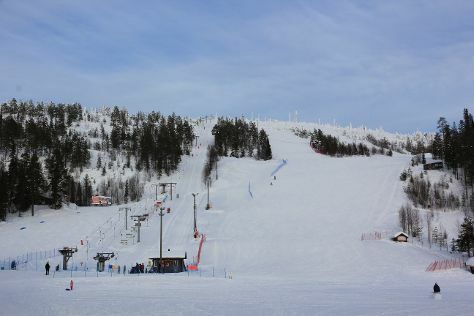 Kick off your visit on the 16th (Fri): hit the slopes at Salla Ski Resort, learn about all things military at Salla Museum of War & Reconstruction, and then steep yourself in history at Paikanselan Taistelualue. To find ratings, reviews, maps, and other tourist information, read Salla journey maker app . Traveling by car from Pyhatunturi to Salla takes 2 hours. In August, daily temperatures in Salla can reach 19°C, while at night they dip to 10°C. Wrap up your sightseeing on the 16th (Fri) to allow time to travel to Posio. Posio is a municipality of Finland. Kick off your visit on the 17th (Sat): explore the wealth of natural beauty at Riisitunturi National Park. On the 18th (Sun), you'll have a packed day of sightseeing: view the masterpieces at Pentik Hill and then take in the dramatic natural features at Korouoma Canyon. To find traveler tips, ratings, photos, and more tourist information, use the Posio trip itinerary maker website . You can drive from Salla to Posio in 1.5 hours. Expect a daytime high around 19°C in August, and nighttime lows around 10°C. Wrap up your sightseeing on the 18th (Sun) to allow time to travel to Savonlinna. Start off your visit on the 19th (Mon): step into the grandiose world of Savonlinna Cathedral, look for gifts at Taito Shop Savonlinna, don't miss a visit to Pikkukirkko, explore the historical opulence of Olavinlinna Castle, then examine the collection at Savonlinna Provincial Museum, and finally appreciate the history behind Olavinlinnan Musta Passi. 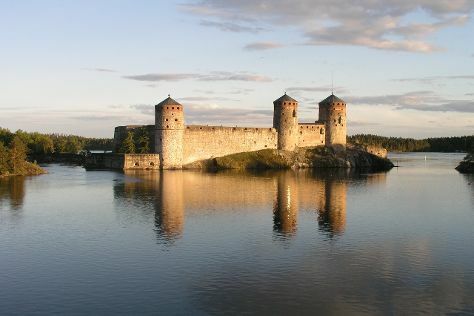 Start your trip to Savonlinna by creating a personalized itinerary on Inspirock. Getting from Posio to Savonlinna by car takes about 7.5 hours. Other options: fly. In August, daily temperatures in Savonlinna can reach 22°C, while at night they dip to 13°C. Wrap up your sightseeing on the 19th (Mon) early enough to drive to Tampere. Vapriikin Museokeskus and Birthplace of Jean Sibelius will appeal to museum buffs. Visit Riihiniemen Uimaranta and Rauhaniemi Beach for some beach relaxation. Take a break from Tampere with a short trip to Linna Golf & Country Club in Haemeenlinna, about 1h 20 min away. There's still lots to do: look for all kinds of wild species at Hatanpaa Arboretum, get a taste of the local shopping with Galleria Ronga, contemplate the long history of Amuri Museum of Workers' Housing, and relax and rejuvenate at some of the top local wellness centers. To see photos, maps, more things to do, and other tourist information, use the Tampere day trip website . Drive from Savonlinna to Tampere in 5 hours. Alternatively, you can do a combination of flight and train; or do a combination of bus and train. In August, plan for daily highs up to 23°C, and evening lows to 11°C. Wrap up your sightseeing by early afternoon on the 23rd (Fri) to allow time for travel back home.